Burn video to DVD disc/folder/ISO file/BD disc. Mount ISO, make bootable ISO images, burn CD, DVD, and Blu-ray discs. Burn video files onto Blu-ray discs. 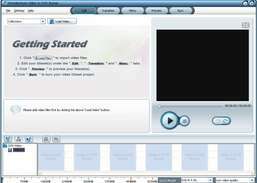 Create DVD disc/DVD folder/DVD ISO file with popular videos like MP4, MOV, AVI, MKV, VOB and so on. Convert AVI, MKV, DivX, and XviD files to DVD format. Burn all popular video and audio files to DVD disc, DVD folder, or ISO files.